Eurocom has developed the world’s first 780 Watt External AC/DC Adapter that is ideal for high-performance SLI laptop developers as well as users and weighs only 2.9 pounds. As laptops continue to increase in performance and power consumption, the AC adapters that power them have not kept pace. To combat this, Eurocom has been supplying customers with either a single 330 Watt adapter or two 330 Watt AC Adapters connected to the laptop through a dongle connector. While the 660W solution was able to provide sufficient power to the chassis and internal components, it was not a convenient or mobile solution. To resolve this, Eurocom has been developing a higher wattage adapter solution for several years. 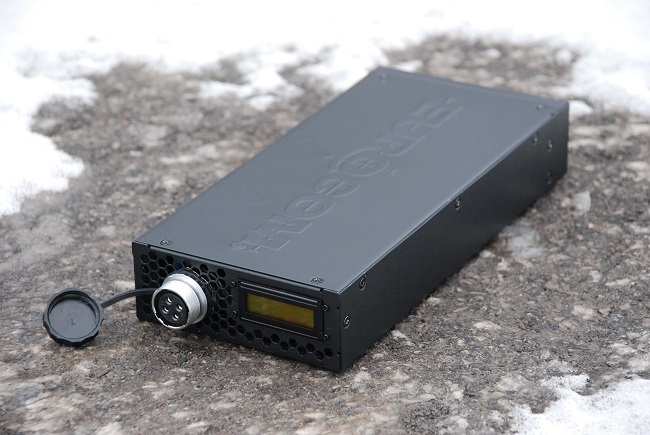 Now available, a 780W AC Adapter/Power Supply solution that is only slightly larger than a single 330W solution can provide more than enough power to laptops with top-of-the-line SLI graphics cards, socket-based desktop CPUs, multiple storage drives, and multiple memory modules with adequate headroom for overclocking the CPU and GPU(s). The 780 W AC/DC Adapter/Power Supply was developed to power the high-performance laptops that Eurocom specializes in, such as the Sky X9E2 and Sky X7E2. This high-efficiency AC adapter can be applied to a variety of high-performance applications, where high efficiency, highly mobile, rugged power supplies are needed. The EUROCOM Sky X9E2 can consume upwards of 600 W during heavy load due to its support of dual NVIDIA GeForce GTX 1080 graphics in SLI, an Intel Core i7 7700K desktop processor, up to four DDR4 SODIMM, four storage drives, a 17.3” 4k display and Thunderbolt 2 peripherals. The 780 W AC Adapter has plenty of overhead to accommodate future technology as well as extreme overclocking so a lack of power never holds our customers back. The 780W AC/DC adapter is equipped with two high-speed fans and ventilation ports to manage the thermals of the internal components of chassis. Since the AC adapter has high efficiency the internal, built-in cooling system rarely kicks in and when it does the high-speed fans make little noise. •	LED Display: A LED display gives users a real-time breakdown of the amps, volts, and wattage. •	Detachable AC and DC Cables: Allows for easy mobility and setup. •	Power Switch: Convenient power switch to turn adapter on or off to conserve power. •	Thermal Solution: Dual high-speed fans for thermal management. •	Auto-Switching Capability: The range of input voltage is from 90Vac to 264Vac to accommodate worldwide deployment. •	Locking DC Cable: Heavy-duty screw locking mechanism ensures the DC cable does not accidentally detach. •	Industrial-Grade Heavy-Duty Metal Chassis: A metal powder-coated enclosure provides a simple yet classy exterior that won’t feel out of place in your home or office.